I mentioned in a post a few days ago that we were testing the web cam out for the Eastern Phoebe nest we have at the nature center. The camera is part of a partnership with the Cornell Lab of Ornithology. On Friday, we changed the angle of the camera to get a better view. We then noticed the very next day that the nest that had been there for several years was gone. It either fell down or the birds knocked it down. This was not a bad thing, it was probably getting too high as the birds added on each year anyhow. The entire thing was probably seven inches high which is overkill. I was talking with co-workers near the window on Monday when I noticed birds flying into the corner of the building where the nest is. I headed to the computer that runs the web cam and took some video. The camera usually only operates in still mode and uploads one photo to the Cornell nest cam website every 20 seconds. By capturing video, we gained not only a new perspective but new information as well. More on that after the video. What you see here is not real time. I have edited out gaps between the birds visiting though those gaps were not long. These birds were really working. The next bird would appear about 20 to 30 seconds after the first bird left. We're seeing both the male and the female building the nest. There are a couple of cool things to note. First off, there are clearly TWO birds building this nest. I find this very interesting as my handy reference The Birder's handbook clearly states that for Eastern Phoebes, only the female builds the nest. I know these are two birds coming in because I could see them out the window but it is also documented in the video two different ways. First off there is behavior. If you watch closely, the two birds clearly have different skill levels at nest building. 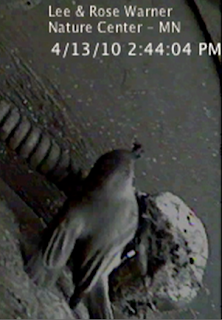 One bird carefully brings back mud and tucks it onto the base (an old electrical junction box) while the other bird comes back and simply drops nesting material and it usually just falls to the ground. This difference can be seen several times in the video. The other clear evidence that these are two birds is this screen capture. One of the birds is banded. This bird is wearing a bird band, no doubt it is one of the bands from our active bird banding program at the nature center. We have banded the adults from this nest in the past. It would appear that one of these birds has used this nest site before though we will have to re-capture the bird at some point to be sure. It will be fun to watch this nest site again this year and I'll be sure to let everyone know when Cornell starts posting the feed from this camera on their nest cam site.